1. 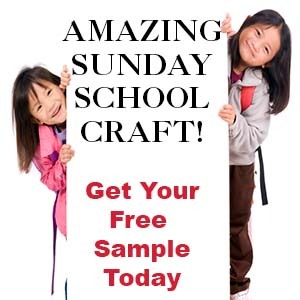 Before class print out the pattern or have your children draw their own designs onto card stock. 2. Cut up pieces of ribbon into twelve-inch lengths. 3. In class have the children color the picture and add stickers. When they are done with their pictures have them glue or tape ribbon across the length of the bottom. 4. Staple the sides together to make at tube. 5. Staple yarn or ribbon at the top to hang the wind sock. 1. Before class print out the Boat Pattern, cut it out, and use it as a template to cut out boats from card stock. 2. To make the boat, fold on the dotted lines. At each end of the boat bring the pointed ends together and glue or tape them together. 3. Cut pieces of Styrofoam to fit inside the boat and glue them to the bottom of the boats. Instead you can place clay or play dough on the bottom of the boat. 4. Cut the ends off of the craft sticks to make the sticks different lengths, some shorter and taller than the others. 5. In class have the children count out twelve sticks plus one for Jesus. Have them draw faces on each stick and color the bottom of the sticks for the clothes. 6. Cut out triangle shapes for the boat's sail. Tape the sail to a straw. 7. Show the children how to press all the craft sticks and the straw into the styrofoam or clay. My husband is a pastor of a small church. I teach Jr. Church ages from 5-11. I am so thankful that I found your web site!! Most of my lessons come from your web site. The class really enjoyed making the boat with the disciples in it. Kathy Aurandt. Act Out the Story "Jesus Calms the Storm"
1. Assign each child a part in the story and explain what he will be doing. If you have extra children have them be disciples. 2. Read the following story and have the children act it out as you read it. Jesus had been teaching crowds of people all day long. They followed him and his disciples wherever they went. It had been a long day and Jesus needed some rest. Jesus and the disciples got into a boat to go to the other side of the sea. Jesus fell fast asleep in the back of the boat. Soon the wind began to blow. The waves were getting bigger and starting to splash into their small boat. Clouds began to roll in and the sky got dark. Lightening began flashing in the sky and it began to rain. The water was coming in faster than they could bail it out. The disciples were getting very scared. They woke Jesus up and yelled through the noise, "Teacher, don't you care if we drown?" Jesus got up and said to the wind and waves, "Quiet! Be still!" The wind died down and it was completely calm. Jesus asked his disciples, "Why are you so afraid? Do you still have no faith?" The disciples were terrified and asked each other, "Who is this? Even the wind and the waves obey him?" 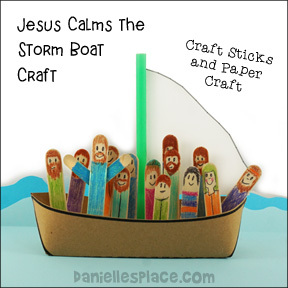 The activity comes from the "Jesus Calms the Storm" lesson on The Resource Room.